Automatic sprinklers are available in spray pendent (SSP). Upright (SSU). conventional (CU/P) and side wall (horizontal installed). 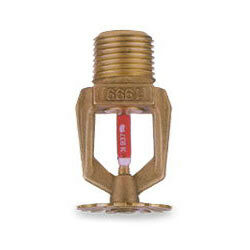 These sprinklers are incorporated with 5mm diameter glass bulb as a heat sensitivee element nominal tem-perature 68C(155F) or 79C(175F). The glass bulb capsule operating mechanism contain a heatsensitive liguid that expands upon applicaton of heat. At the rated temperature the frangible capsule reuture thereby releasing the orifice seal, The sprinnkler then discharges water in a pre-desinged spray pattern to control or extinguish the fire.